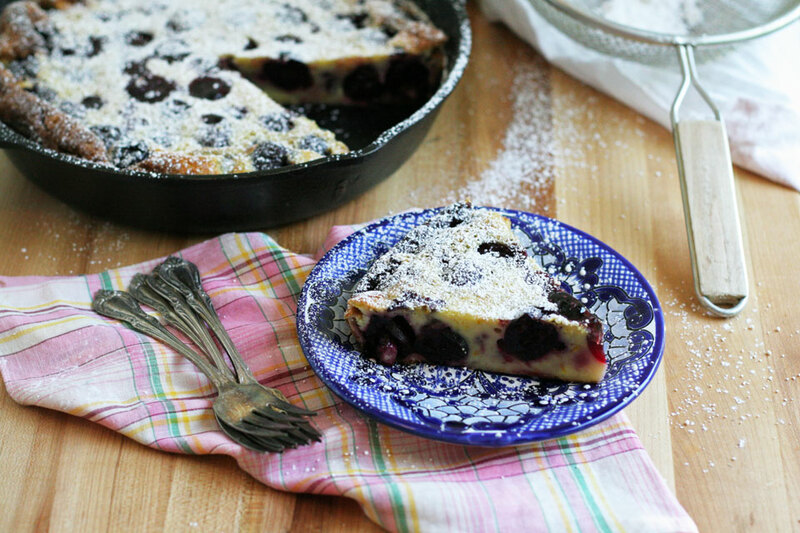 I got home, and four more pounds were purchased that I hid from myself to be able to make this dessert for you and the TV segment where I’ll be sharing how to make this and fun ways to pit cherries without a cherry pitter. Phew, I actually made a cherry dessert! 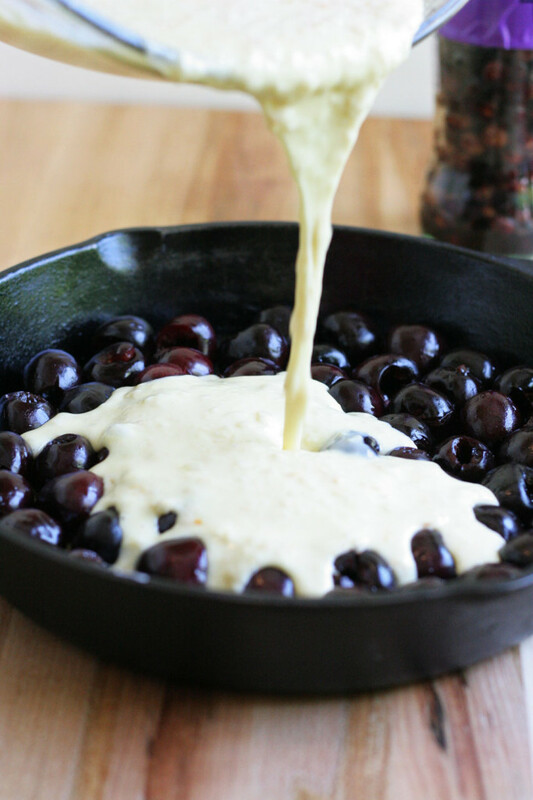 I did use the deep red cherries for this, it is a very classic dessert that I wanted to keep original. You could make this with Rainier, they a bit sweeter, so I would omit a bit of sugar, but it would be lovely. I can’t, I ate them, all of them. I may have already purchased twenty pounds in the span of two weeks, and you better believe there will be more. I should buy stock. Note: It’s hot out, so I made this early in the morning. It takes 40 minutes total, including baking time, and a sweet treat for breakfast! Note: I used a 10 inch cast iron skillet. You could use a Pyrex, cake pan, pie tin, or tart pan. Just be sure it is a 10 inch pan, or adjusting baking time as needed. 1. Butter the baking dish, set aside. 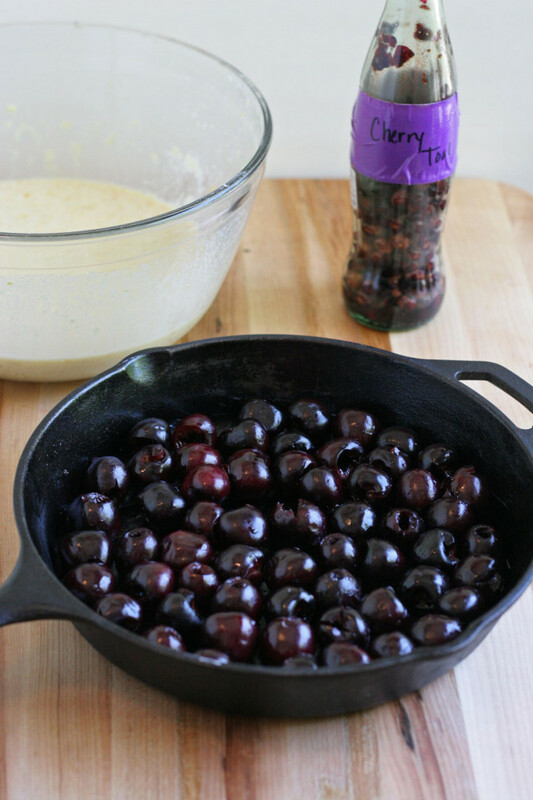 Place the pitted cherries evenly in the bottom of the baking pan. 2. In a medium bowl, add the flour, sugar, and salt, whisk to combine. In a large bowl, add the milk, cream, eggs, vanilla extract, and orange zest, whisk to combine. Add the flour mixture to the milk mixture, whisk to combine well. 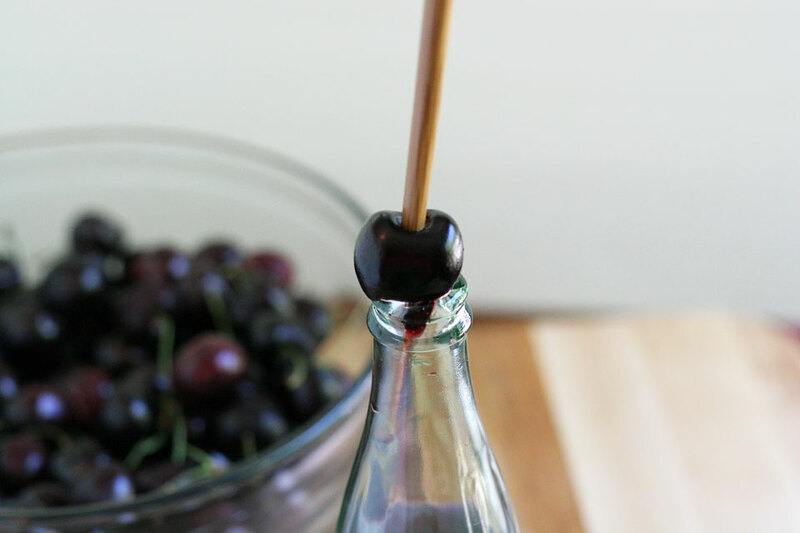 Pour the mixture over the cherries, place in the oven, bake for 25 minutes. 3. Remove from oven, and allow to cool for 10 minutes. 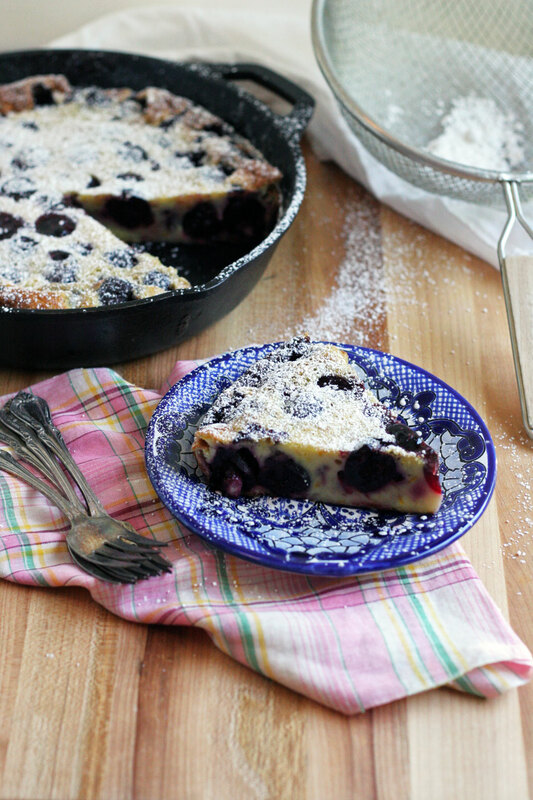 Serve warm or at room temperature with a dusting of confectioner sugar. Store leftovers in an airtight container in the fridge for up to three days. Best served fresh though. No joke. Our family eats cherries in world record time! We bought 2 bags of Rainier cherries yesterday and there is 1/2 bag left… For know… I’ll eat them in about 20 mins.